I’m going to take a few minutes to put the Confederate battle flag debate into a historical context that I think has been largely overlooked by the media, mainly because they have no idea how we got here. During the Civil War, the Confederate battle flag’s use on the battlefield was confined generally to Robert E. Lee’s Army of Northern Virginia, and in its rectangular version, the Army of the Tennessee. (It was also used as a naval jack, but honestly, there just wasn’t much of a Confederate navy out there.) In 1863, the battle flag was incorporated as the canton in a new national flag, where it remained throughout the remainder of the war, through two versions of that flag. When the war ended, and through twelve years of Reconstruction, the federal government extended their ban of Confederate symbology throughout the conquered South. 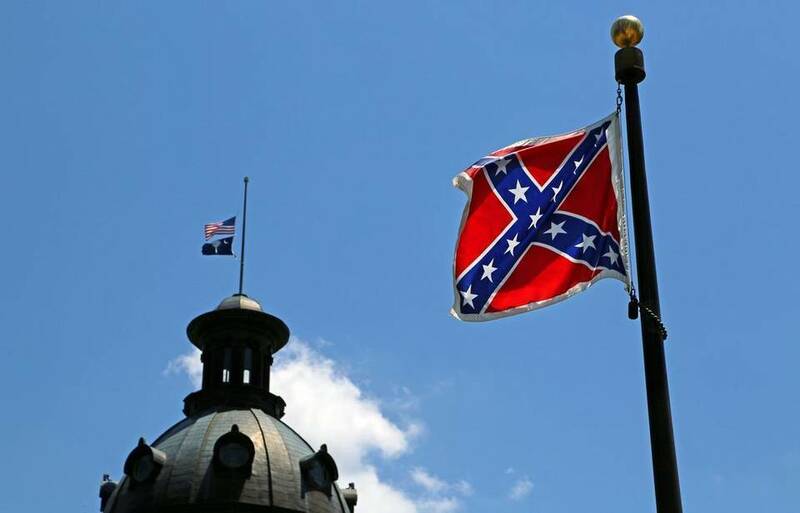 The battle flag would have been rarely seen in public during this time. It was during Reconstruction that the federal government worked hard to elevate the status of the freed slaves, and to prevent the defeated whites from returning them to something akin to their previous state. It was a relentless task, as southern whites were determined to restore the status quo, regardless of federal occupation troops. An important part of this atmosphere of reconciliation was allowing a Confederate mythology to emerge, a mythology that essentially washed the war clean of its most distasteful elements, and allowed the southern people to be proud of the part they played in the war. It was seen as a positive development for the defeated South to have its own pantheon of heroes and cherished legends. At the very least, it was assumed to be harmless. Confederate leaders such as Robert E. Lee, “Stonewall” Jackson and Jefferson Davis became noble icons of a beautiful past. Statues to them and to the soldiers who fought for them were erected across the country. Wreaths, bouquets, and yes, flags, were placed at their cold, stoney feet. A new religion was being born. By 1900, much of the Confederate mythology of the “Lost Cause” had become accepted as fact, and was incorporated into textbooks and the narratives at a growing number of federal military parks that had come to occupy the sites of former Civil War battles. In the interest of sectional harmony, the South’s version of the war became the official version of the war. Coincidentally, in the deep South lynchings had become regular occurrences by 1900, with over 100 blacks victimized in 1900 alone. During this time, Confederate symbology began to feature prominently in public places in the South, as angry whites yearned for their lost Camelot, and lost power. 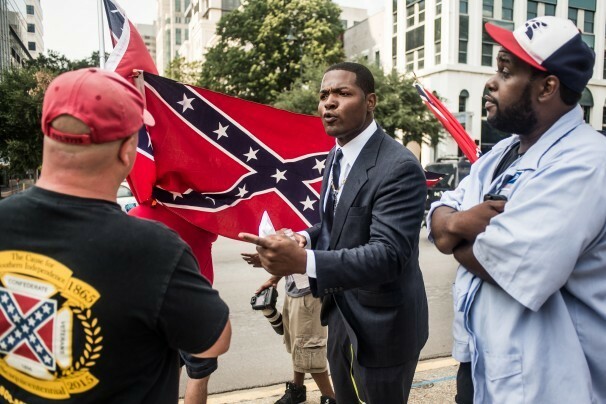 As the 20th century progressed, the Confederate battle flag became the banner not of specific armies in a previous century’s war, but as the symbol of resistance to change – and African-American civil rights. The Ku Klux Klan adopted the flag as its own, as did the Dixiecrats in mid-century. The Unreconstructed Confederate of the 19th century had become the segregationist of the 20th, and the battle flag was his emblem. The pain felt by African-Americans at the sight of this symbol of repression was, however, still not believed to be of consequence to the majority of whites. Sectional harmony, especially critical to candidates with national aspirations, was of more immediate concern. The flag, while certainly representing a backwards-looking ugliness, was really a harmless thing, it was believed. Educated whites may have mocked it, but at the same time they underestimated the statement it made, and the influence it had. In the 21st century, segregation is legally dead (through practically alive), but a new generation of white supremacists have adopted the flag, not as a way to honor selected regiments in the Army of Northern Virginia, but because of what they believe the flag represents. And none of those values are good. The white population in the United States, had, until June 17, been able to delude itself that the Confederate battle flag was simply a harmless symbol of “Southern pride,” as if “Southern pride” revolved around certain types of food, or a pleasing manner of hospitality. Sadly, on that day, Dylann Roof delivered what our consciousness had always been lacking: a clear, direct connection between Confederate symbology and racist violence. We had been able to easily dismiss the wounded feelings of African-Americans, but we could not dismiss their bloodied corpses. Now, one hundred and fifty years after the perpetrators of the Fort Pillow massacre lost the Civil War, the victorious United States of America finally seems willing to correctly play the role of the victors. And finally, after decades in denial, we may finally appreciate the role that symbols have had in perpetuating the racial hatred and violence we have, for too long, struggled to explain, much less conquer.